Eskom is in discussions with Petro SA to accelerate the offloading of a shipment of diesel in a bid to ease the need for load shedding. The ship carrying the diesel is understood to be close to Mossel Bay in the Western Cape, according to Eskom spokesperson Andrew Etzinger. He told Fin24 the power utility is stressing to Petro SA that urgent offloading of the fuel is a priority. The open cycle gas turbines, powered by diesel, are used as an emergency measure by Eskom as they are costlier than burning coal. The shipment was expected by Eskom to have arrived earlier this week and been in use by Thursday, the public holiday, which would also coincide with demand falling, reducing the need for load shedding. Etzinger said the need to implement rolling blackouts on Thursday and into the weekend would depend on the arrival of the diesel, as it is a "game changer". Eskom CEO Phakamani Hadebe told a media briefing on Tuesday that the country had depleted its diesel stocks, except for cars and small utilities. South Africans have grappled with rotational power cuts since last week Friday, which has affected businesses, led to traffic snarl ups, slowed some mobile networks and sparked warnings of possible water cuts due to pumping issues. Eskom has oscillated between Stage Two and Stage Four load shedding since Friday. Stage Four cuts 4 000 MW from the national grid, depending on schedules, and this means more frequent power outages for users. Eskom has installed capacity of 48 000 MW but less than 28 000 MW have been available due to a number of issues affecting the generation of electricity. There have also been at least eight boiler tube leaks, which require on average a week to be fixed. Tropical Cyclone Idai, which hit Mozambique and Zimbabwe last week, killed over 1 000 people. It also knocked out the transmission lines between the Cahora Bassa electric dam in Mozambique and South Africa, removing 1 150 MW of power from the system. The lack of diesel in the country has exacerbated the problem as Eskom has been largely unable to use this as an emergency measure. Etzinger said the process was underway to re-establish the contract for a system which allows for the early detection of boiler tube leaks, the largest cause of power units tripping and failing. 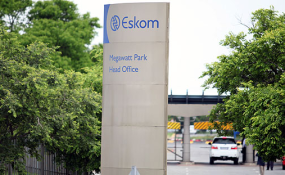 Eskom's chief operations officer Jan Oberholzer said on Tuesday that Eskom only had itself to blame for the lapse of the tender. The early detection system allowed the power utility to have insight into the complex tubing networks inside boilers and fix areas under pressure during planned maintenance. The number of boiler tube leaks leading to power units going down has increased in the last year since the contract ended. Etzinger, however, warned that even once the tender for the early detection system is in place, this would not immediately resolve the issue of boiler tube leaks. He said the system would still need to gather data on the boilers used by the power utility and analyse this. "It's not like load shedding stops the next day... there's a lag of probably six months," Etzinger said. Minister of Public Enterprises Pravin Gordhan on Tuesday could not give an end date to the rotational power cuts. He promised another update in 10-14 days after a technical review team has visited the power stations to understand the issues they face.